Each year we try and support local charities and at Christmas 2008 we donated hampers full of festive pickings to a local homeless trust. 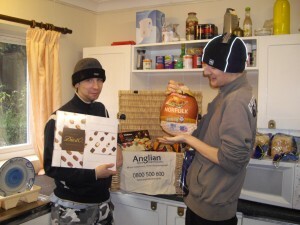 Some of the residents at the St Martins Trust receiving their Christmas hampers. St Martins Trust is an essential service within Norwich’s community for providing direct access accommodation, residential care, support and development to enable everyone to achieve their full potential and a greater level of independence.